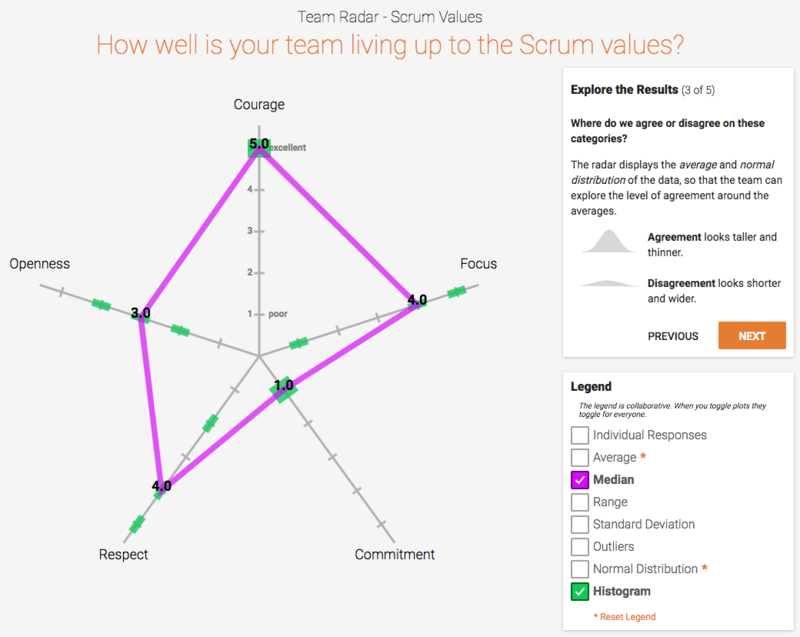 What is a Team Radar Retrospective in Retrium? 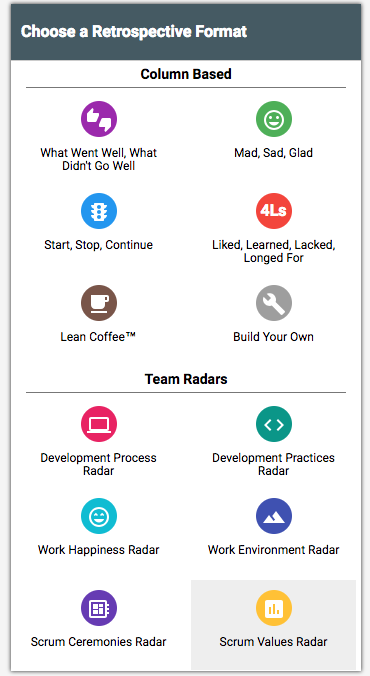 Team radars are a set of options in Retrium for gathering data in a retrospective. 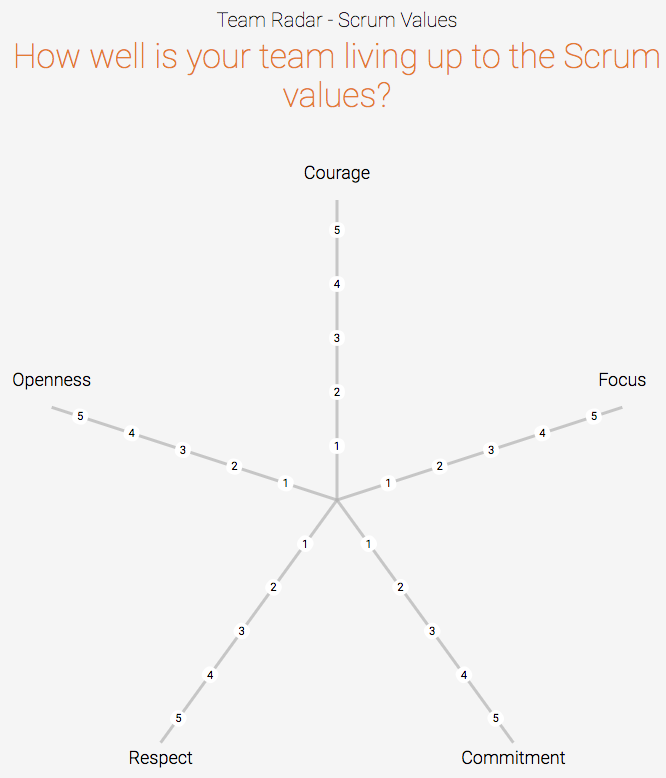 They’re used to gauge how the team is doing in areas like development practices, culture and values, Agile practices, or other topics. 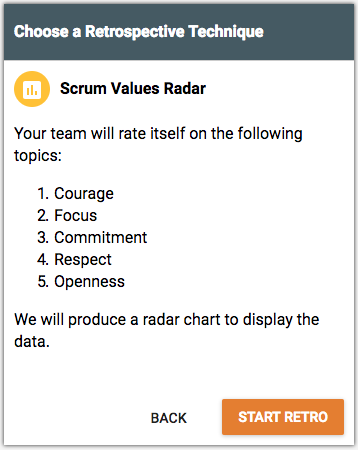 Radars can be especially useful because they can help get team members on the same page, illuminate agreement or disagreement, and allow for reflection at both the individual and team level. A radar functions like a short survey to quickly understand where things are going well (or not) and where perspectives may differ. Because you can easily see individual responses and aggregated results (like the average, standard deviation, etc), it’s an efficient way to focus the discussion on the most important topics. Radars are quite different than a column-based retrospective because your team members don’t generate any text-based notes in Retrium. 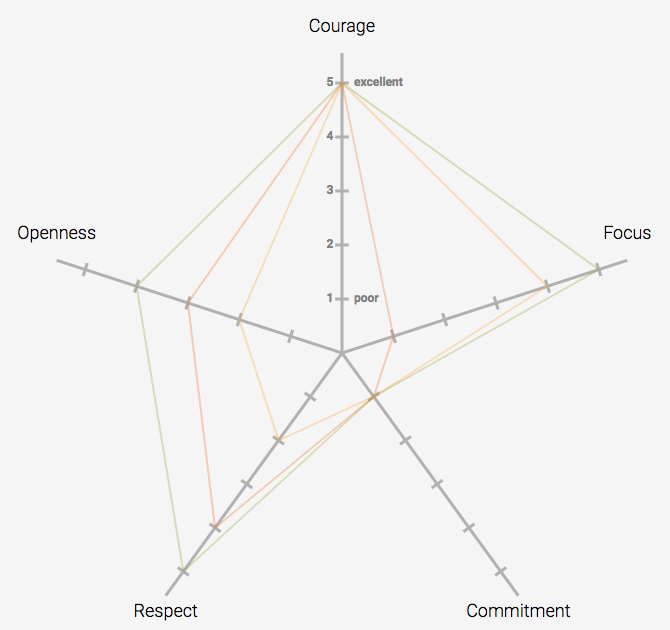 Instead, each team member provides a response on a scale of 1-5 and the results are automatically calculated and displayed on a radar chart. How do I run a Team Radar in Retrium? 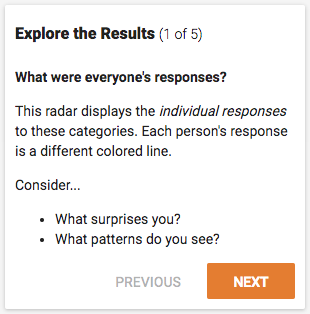 Before collecting the responses, you just need to select your Team Radar technique from the menu. Before the retro starts, you'll see what items are included for the team's feedback. Just click the button to start the retrospective to begin. Unlike our column-based retrospective techniques, team members provide ratings on a set of pre-determined topics, attributes, issues, or categories during the data gathering step of the retrospective. The category is listed as a label on each spoke. Everyone then anonymously enters their response on a scale of 1-5. This is done all at the same time, so it’s really fast! The line colors are randomly generated each time you use a Team Radar. The lines will connect as choices are made on each spoke. You can see who has responded using the left panel, which shows information about presence. 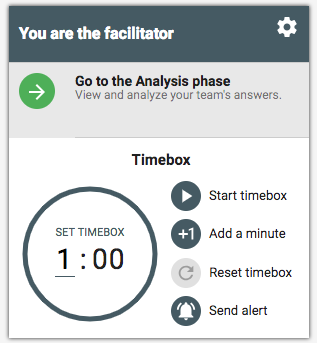 Once everyone has made their selections, the facilitator can advance the retrospective to the analysis phase using the menu in the bottom right of the page. We do all the work to plot the individual responses and automatically calculate metrics like the average, standard deviation, and much more. This saves teams a ton of time, especially with larger groups! By default the individual responses are displayed. Use the box label "Explore the Results" to look at different plots. The facilitator can advance the selection to show a pre-selected combinations of statistics to help you understand individual scores, agreement and disagreement, and divergence. You can also turn on and off the plots using the legend. What interesting points or patterns are visible on the radar? What is surprising or unexpected? What spokes warrant further feedback, discussion, or clarity? What spokes do we want to highlight or celebrate? What spokes warrant improvement, action items, or other next steps? What information should be shared with leadership or other teams? What trends have we seen over time in our radars? Because the analysis phase is the last step of this retro format, you may want to leave the board open until the team is done discussing what they see and deciding what to do. 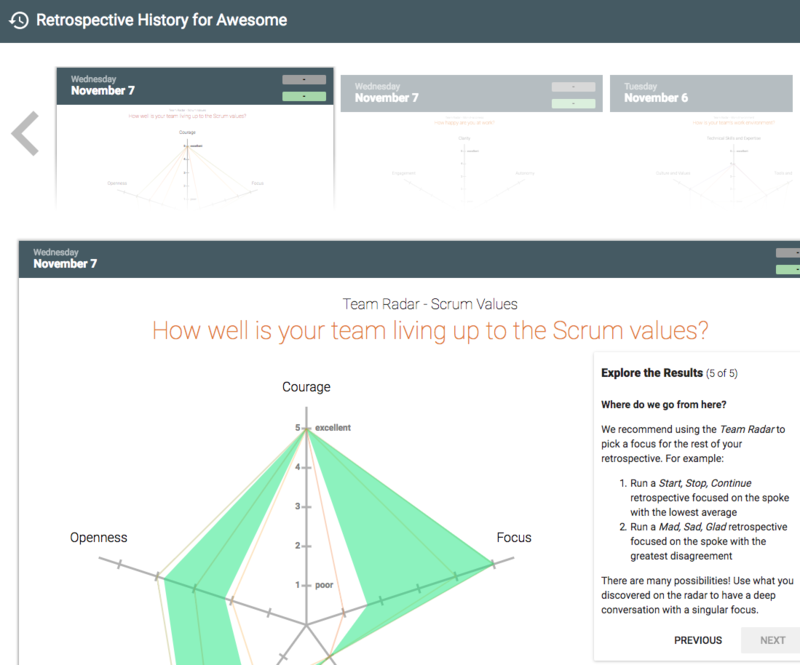 Once you advance the retrospective, it will end the Team Radar and it will be saved to your retrospective history. 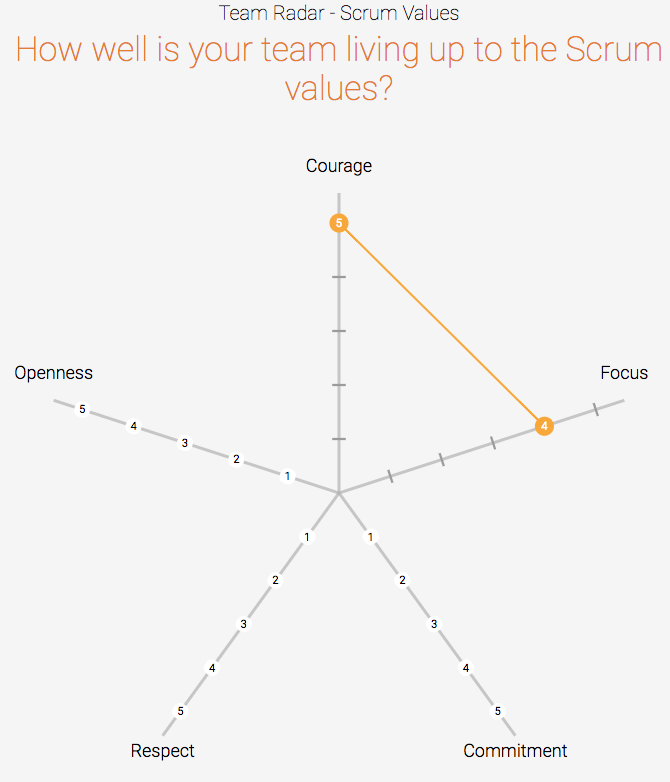 After a Team Radar, you might consider using a column-based technique to dig into a topic further. You can run one of our standard techniques like mad, sad, glad, or stop, start continue on the specific spoke. 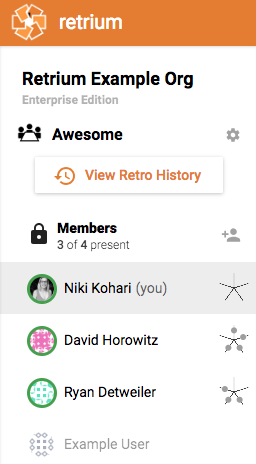 Another option is to do a custom retrospective with one or more spokes as the column headings. When Would I Use a Radar? 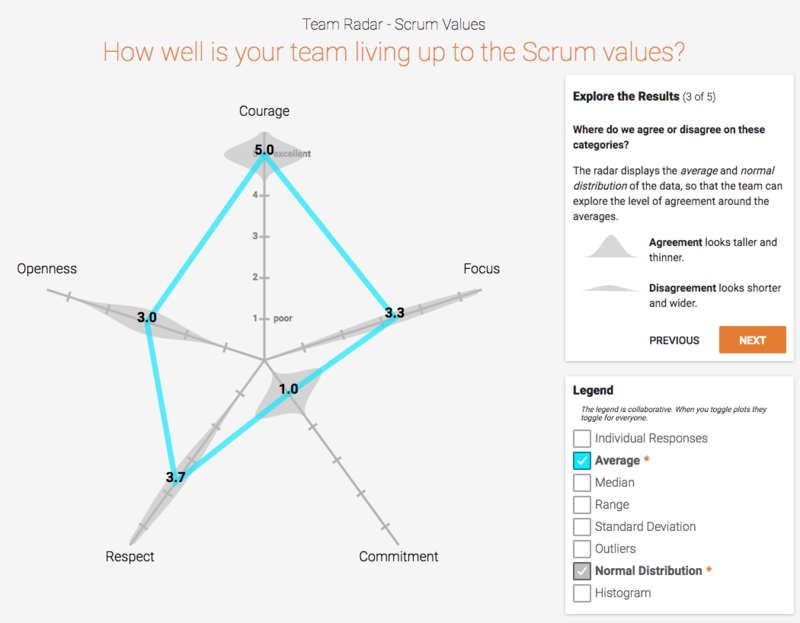 Ultimately, the decision of when to use a radar is best determined by the team, Agile Coach, or Scrum Master. While individual responses are anonymous and choices are made at the same time, the analysis does show and compare the individual choices. 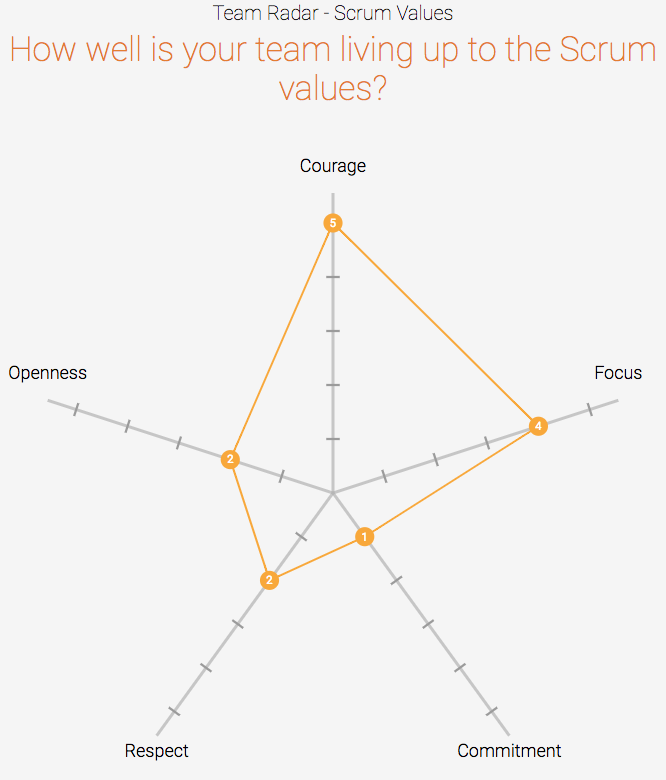 This means that having an established team with trust and psychological safety is best for this technique. We currently offer 6 different radar options.